Fifties vintage lucite box style handbag. White pearl satin and clear Lucite. 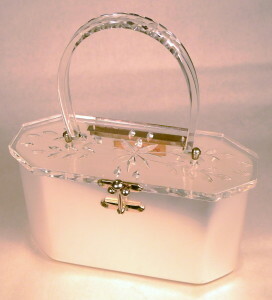 Eight sided box style pearl satin lucite handbag. Carved clear lid and handle. Four clear lucite button feet. Silver tone hardware and three ball & bar snap closure. The lucite box... a fifties classic! EXCELLENT condition. Shows only the slightest wear.